Be a part of one of Kenosha’s 2019 Signature Events! 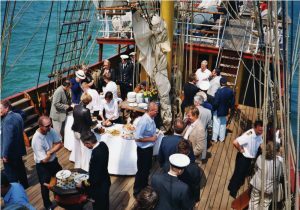 With an estimated 30,000 visitors expected from around the region and an international fleet of tall ships, this experiential event provides product and name exposure, product sampling, and unique hospitality opportunities. The wind will bring the world to Kenosha! Please note: additional people may be accommodated on the dock next to the ship.